Born in '73 I developed a passion for roleplaying,gaming and minatures in my early teens. This blog will be an attempt to engage with the gamer community as well as catalogue my collection of minatures both painted and unpainted. In addition to the occasional off topic rambling. So what did I spend my hard earned cash on before I had a family or a mortgage? 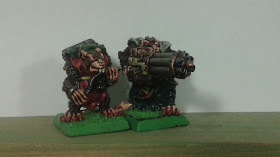 In this post I'm going to be looking at some of my Skaven, this army that I have been building took me over 5 years to paint not just because I am so slow at painting which I am, but because of the way I chose to paint it. Up untill two years ago I always tried to paint my minis to the very best of my ability using inks,and blending. I wasnt the best painter in the world but for me it was good enough however taking all that time on each minature was very time consuming. Also for me the idea of a Skaven force having a unified colour was ridiculous, they are a race of scavengers, living of the scraps of those in the "above world" the thought that a clan warlord could outfit an army with the same uniform, no matter how ragged is preposterous. So I elected to paint all my rats in batches of 5 and gave them individual colours representing whatever they could scavenge to use for clothes. Only my Stormvirmin have a unified unit colour representing the fact that not only would they get first pickings but also they they could beat up and take whatever they wanted from the other, smaller rats and that the warlord would also make the effort to supply them with the best equipment and uniforms he could to keep him looking important and them happy and hopefully less rebellious. So I have managed to paint up about 5000-6000 pts of Skaven most of wihch is from the old ranges back when I just took the catalogue and order 10 or 20 of each non charicter minature. Added to this there are a couple of the old metal doom wheels which I am undecided about, on the one hand I like the retro-ism of them (if thats a even a word) however I like the look of the newer plastic version even better. And thanks to the rules on making up your own units and vehicles in the 3red ed WFB and RT book making up rules for them shouldnt be too much of an issue to use them retro gaming. I also have 15 rat-ogres not the origional variery though but the "second ed" versions and a couple of the 3rd ed ones (no plastic versions though). What I realy need to finish painiting is my screaming bell (second ed version) as for the larger point games I'd realy like to use one again with home brew rules, possibly smashing together the old skaven black arc rules from revenge of the lichmaster, the later screaming bell rules and the 3rd ed rules for war alters as all 3 seem suitable however balancing them off and still getting a reasonable points cost will be the key. Anyway on to the figures, first up a NON citadel miniature, back when I was 18 I spent some time in Australia in the 90's, there was an Australian manufacturer who was trying to undercut GW in the fantasy miniatures market. Which is quite easy as their products weren't imported so didn't get hit with the massive import tax that is still crippling the games industry down there today. The sculpting was more than a little shonky but for a couple of $ a mini they were less than half the GW price, and their "not skaven" range were quite quirky so I bought a few back with me including the guys below. Now you have to bear in mind that this miniature predates the current "rattling gun" by at least 15 years so you have to wonder if GW hadn't shut them down would they be sending GW a CnD letter? At the time we were playing advanced heroquest and this bad boy got to see a little house-ruled action....assuming it didn't blow itself up that is. I think This was sold as a gatling cannon. Here they are together ready to wreak devastation. Next up We have a mix of animal handlers and giant rats, I think originally the guy on the right was released as a Skaven hero but over the years he was demoted down to a beast master before being consigned to the dreaded OOP category which is a real shame as the old Skaven are a great range and I'm glad that my army is mostly old metals, though I do notice it when I'm lugging it about as opposed to my plastic undead force! For the bulk of your Skaven army you need clanrats, LOTS of clanrats and I have to say that I LOVE these miniatures, again the guy in the middle was amongst the first released from the C47 Ratmen (Skaven) range back in '85 with the title "clan retainer", and they really gave you the feel for exactly what a ratman was and helped define the range to this day even down to the typicly Skaven spiked mace. The one on the left was from the later range that expanded the origional release the year before. First seen in the '86 Citadel Journal he was called "skewer" and his mate in the middle was given the name "Goar headwrecker". I loved the idea that they all had names, sadly this was eventually replaced with a rather more usefull (but in my estimation less fun) catalogue number. Interestingly this release is also where we see Thrott the unclean for the first time. You may also notice that I chose to give these the shields from the advanced heroquest Skaven. At the time I didn't want to paint the plastics as the detailing wasn't as good as the metals I had but at the time the Skaven and indeed all miniatures came with plain shields that just had the raised rim and a hole in the middle to mount it on the minature. Now not being the worlds best painter I found the thought of free hand painting all those shields more than a little daunting so I took the easy option and used the AHQ ones. I still have the AHQ Skaven and will eventually get round to painting them, as for what shields to use on them when I do? I don't know. I could to try to score some more of ebay, have a go at casting some up form the few I have left over, or use more modern ones. My gut (and my wallet) tells me to just use what I have knocking about, but my heart tells me to try to get some originals to match them. Time will tell. Lastly in this piccy we have a much later clanrat with two hand weapons, I'm not sure on the release date of this one as I haven't been able to find him at the normal places I tend to look for mini information, I do recollect a WD release page for him and his mates but my WD's are boxed up in the loft at the moment so I cant go hunting for the info so if you know tell me and I'll update the post. Here we have in my opinion the best poison wind globardiers citadel have ever produced. 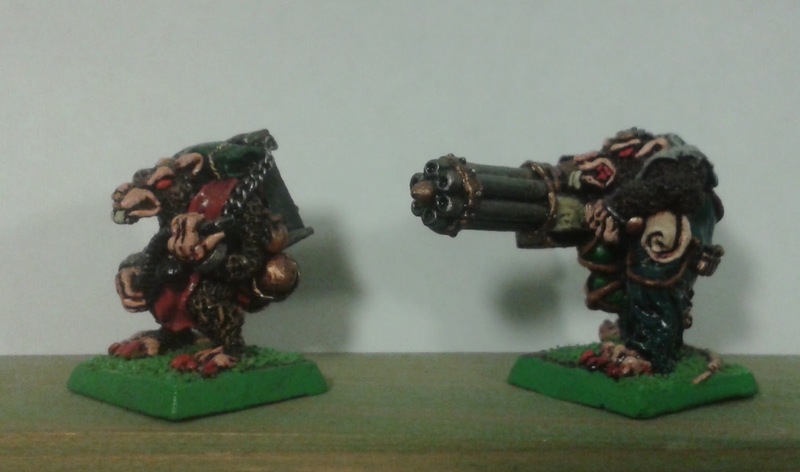 Probably released some time in '89 as part of the Skaven war machines packs they are great, covered in nice details as well as sporting "protective" gas masks and breathing apparatus to protect them from the deadly fumes of their poisonous glass globes. Well that's about it for now as I have other things to go do, please do comment and in the meantime I'll see about digging in the lead mountain for some unpainted minatures, I have some confrontation gangers knocking about as well as some old school imperial guard and a bugbear tribe living on my CD rack that all need photographing. *Don't quote me on that as it was a long time ago but I do seem to remember their being a "its NOT to go back to head office , EVERYTHING must go get what you can for them" policy, so who knows. This all seems very promising! You HAVE to show them, I mean it. Looking forward to seeing the whole skaevn army. Thanks, I have gotten round to taking piccys of them and will be posting them up next, especialy as I have realised that I have a few available to trade. Since having a few available might be a problem in short term for you, I'm commited to helping you the best I can and will be more than glad to trad with you to relieve you from this issue. It's my commitment to other leadheads. Born in '73 I developed a passion for gaming, roleplaying and minatures.